Powdermills Pottery is housed in granite buildings that were once part of a nineteenth century gunpowder factory. It is found in the very centre of Dartmoor National Park in Devon and is part of the Duchy of Cornwall estate. Powdermills is the home and workplace of potter, Joss Hibbs: her range of pottery is sold The Shop. Cream teas are served in the courtyard in the Summer season, and intensive Throwing Courses are run year-round. The old workshop has been rejuvenated by local chairty Friends of the Dartmoor Hill Pony and now houses the Dartmoor Hill Pony Exhibition, explaining the history and importance of the 'wild' ponies on Dartmoor. If you would like to see how Joss makes pots from materials found on Dartmoor using an 'anagama' kiln, please view the short film found on The Pottery page of this website. Joss' Blog gives you an as-it-happens insight into current activities at the pottery (you can also find Joss Pottery on Twitter or Instagram, or Joss at Powdermills on Facebook). 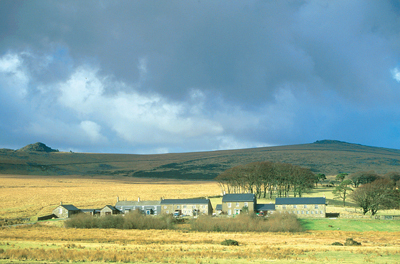 A visit to Powdermills offers a glimpse of all the things Dartmoor has to offer: wild landscape and wildlife (especially birdlife); history and nearby walks to prehistoric sites; local food and time to relax. We look forward to welcoming you here. March-October it is open on Saturdays and Sundays.